If you are using Internet to download software then you most probably installed some toolbars which comes with the software. But the thing is, these toolbar won’t be helpful in any manner. It just occupy lot’s of space on our browser and affects our day to day browsing activity. Removing Toolbars can easily done with control panel or with their respective browser option. But many of them are not familiar with this. 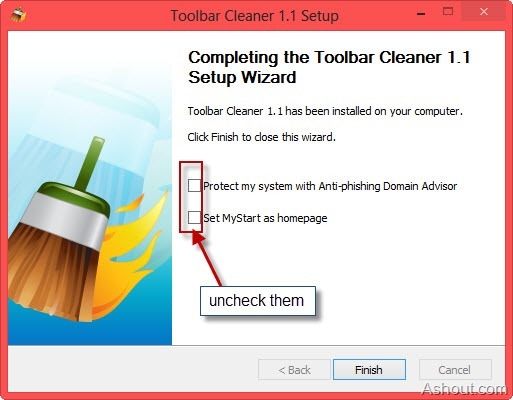 If you are one of them, then here is a nice small software called “Toolbar Cleaner” which helps in removing all types of toolbar from your computer easily. 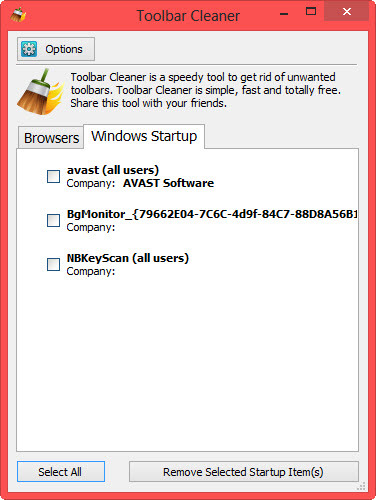 Toolbar cleaner software comes free of charge. But when you install this software on your PC, it will change default home page of your browser to something else ( MyStart website). To stop changing home page, just uncheck “Set MyStart as homepage” when you’re going to install this software. I also recommend to uncheck first option as well. To start using Toolbar cleaner software, just launch the software. You will see the interface as shown in below image. 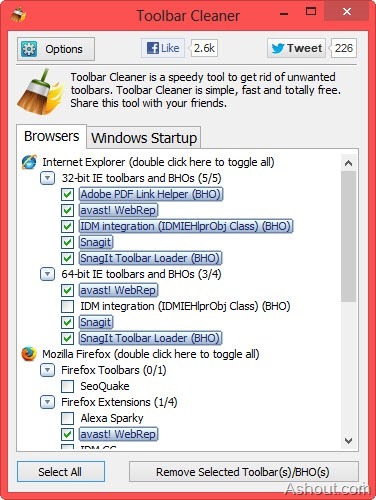 Toolbar cleaner automatically scans the browser which you have installed on your PC and shows the toolbar which are installed with those browser automatically. To remove those unwanted tool-bars, just check the toolbars which are not necessary for you and click on “Remove selected Toolbar(s)/BHO(s)” button. That’s it. It will remove all the selected toolbars from your PC. This toolbar cleaner also comes with “Windows Startup” remover option. If your PC taking too much time to startup, then there maybe lot of apps are running at windows startup. Most of the apps which start at startup of your PC are not at all necessary. To remove unwanted startup in windows select “Windows Startup” tab in toolbar cleaner and check the apps which are not necessary to run at windows startup and click “Remove Selected Startup Item(s)”.